To date Scientists haven't paid as much attention to the study of seaweeds as they have to terrestrial plants. There is much to learn from which seaweeds different animals eat as to how they grow. 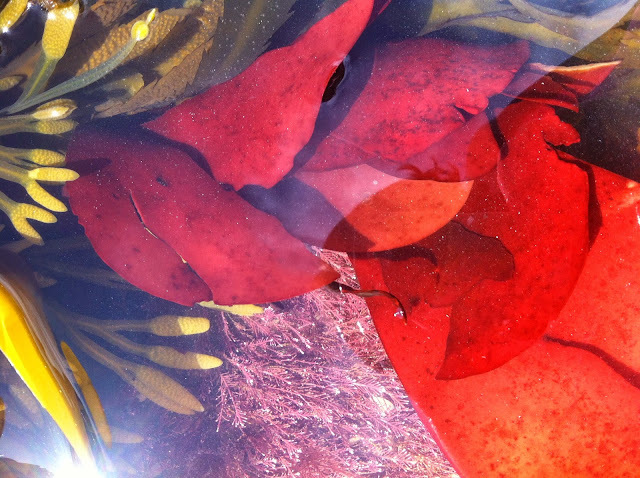 Seaweeds are divided by colour into three main groups: red, brown and green. Worldwide there are about 10,000 in total of which 7,000 are red, 2,000 brown and 1,000 green. That's a lot of seaweed to learn about. There are about 650 identified species around our UK shores, although correct identification may require the help of an expert equipped with a magnifying glass. The good news about foraging seaweed is that unlike some species of fungi, it isn't poisonous.The Desmarestia spp is one to avoid because it contains sulphuric acid in its cells, which it releases when picked. You may like to pick it to preserve and mount it on a card - it is pretty but not to eat. Don't store it in a bag with other seaweeds because it will rot them. The bad seaweed news ends here. Identify the Desmarestia spp from a decent guide or one of Mike Guiry's websites and the coast is clear. British Seaweed is now for sale on the High Street. Mara seaweed is available in Marks and Spencer and fresh seaweed from The Cornish Seaweed Company is available in Tesco. Sea spaghetti or thong weed is as this company says in their press release, the seaweed most reminiscent of a store cupboard ingredient. Those who like to build seaweed bridges might cook it 50:50 with wheat spaghetti. My foraged sea spaghetti cooks in about 20-25 minutes. Blanched and refreshed it's a useful salad ingredient. I mix dried and ground sea spaghetti with Hebridean sea salt and I also use it in my seaweed sourdough starter. Once you consider seaweed beyond green and slimy and treat it as you would a vegetable, herb or spice, the culinary inventions are endless. There is little didactic instruction available where seaweed is concerned, so even the timid cook has little fear of criticism from the great of the food world. Kelp is now being farmed in Ireland and sold ready to use. I note that they blanche the kelps, oar weed and sugar kelp, and also dabberlocks before it is frozen. This is useful information for the forager with a freezer. If you forage your own sea spaghetti blanch this seaweed before freezing too. Well washed and dried dulse can just be popped in the freezer. Over the summer months landlocked folk who holiday by the sea might check up on tide times and chase a low spring tide (when the sea retreats to expose rocks usually covered by water). 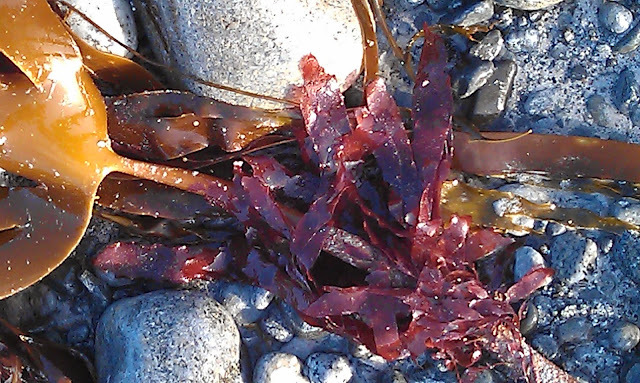 Dulse is a delicious red seaweed to look out for. It grows on rocks and also on other seaweeds It looks like a hand with fingers and varies in colour from red to ruby brown. False dulse is available so check your specie carefully. Dulse remains malleable when dried, which is why historically, coastal folk chewed it. I think that it tastes of bacon. The red seaweeds are kitchen chameleons and release red pigment with heat. Culinary experimental is a colourful experience. Dulse cooks within potato cooking time and mixed together a dulse and potato rissole is a cheap and tasty supper. Seaweed as a cook's ingredient has come a long way in the two years that have passed since I sent in a seaweed book proposal. Living on an Outer Hebridean Isle, where in the words of my publisher, seaweed runs amok, means that it is not surprising that I choose to experiment with sea vegetables over terrestrial ones. At times, my home-grown earthy vegetables have a very good chance of being blown out into the Atlantic by powerful gales and the produce on offer in my local supermarket is, during bouts of inclement weather, often delayed on ferryboats. Weather aside, the Hebridean infrastructure is fragile at its best and does little to enhance the appearance of any mainland grown fresh product, never mind consideration of its effect on nutrients. This weekend a brother in law and I fed seaweed to my elderly mother in law. The food on offer by the nursing home had been declined and yet after a little coaxing, my ma in law cleared her plates of food. Seaweed was the secret ingredient in most of the courses. Over the years I've noticed that my mother in law added extra salt to any food that I prepared. I gather that additional salt, coupled with an increased liking for sugar is commonplace in the preferred taste of many older people. I’d like to suggest that seaweed, which is lower in sodium than salt, might be a useful 'sprinkle' for Nursing Homes to consider. The barrier will of course be budget because the seaweed sprinkles (now available in Marks and Spencer nationwide) are expensive. Hopefully with the passing of time and future harvesting and drying research, seaweed prices will lower, thus making it a more accessible ingredient. So what you may ask, did my mother in law eat: homemade Jersey potato and leek soup, seaweed bread, avocado and a rhubarb and sugar kelp custard tart - I cook with seaweed as most folk use herbs and spices but also use seaweed as a vegetable too. Vraic (from the Jersey French word for seaweed) is used in the manure in which Jersey potatoes are grown and so adding seaweed to potato salads or as flavouring, is to my mind, a very natural progression. I always add a good pinch of kelp (kombu) to my stocks, in much the way that the Japanese use it in dashi. 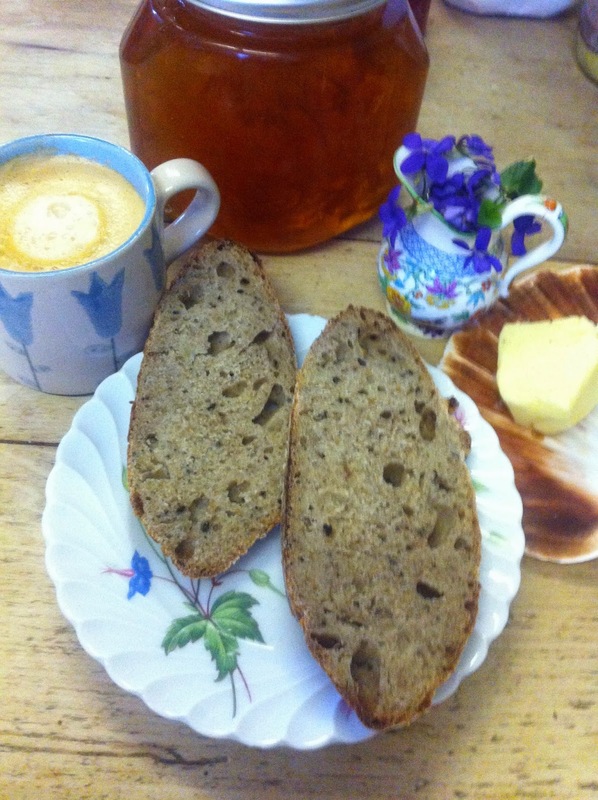 I have a live seaweed sourdough starter but when time is short, I simply add a good handful of dried laver (nori) or dulse to my traditional 'yeast' bread recipe. My mother in law’s bread was flavoured with dried laver, which to my palate is one of the milder species of seaweed. The avocado was unadulterated but when I mash avocado in sandwiches, I usually mix in some dried laver or for extra punch, pepper dulse or sea lettuce. Sugar kelp (kombu royale) as the name suggests is sweet. I used it in the custard of the rhubarb tart. It is a freely available (to coastal folk) replacement for vanilla. I also added a good pinch of sugar kelp to the shortcrust pastry. Seaweed in the Kitchen will be published by Prospect Books and includes recipes that use seaweed as a vegetable in much the way that we cook with terrestrial vegetables but there are plenty of ‘sprinkling’ ideas too. Mara Seaweed http://maraseaweed.com is on sale in Marks and Spencer but there are other UK producers to consider: The Cornish Seaweed Company, Just Seaweed, Ocean Harvest Jersey, Atlantic Kitchen, Seagreens and the Pembrokeshire Beach Food Company to name but six. Dulse is included in the list of Britain's forgotten food The Ark of Taste but carrageen, another red seaweed is still eaten by the elderly and infirm on many Hebridean Islands. We need to encourage the young to consider seaweed, albeit once a poverty ingredient and then share the idea with their grandparents - ideally before those in the know ask for carrageen.